Details: Duke was reserve champion 2017 at the German National Shire Horse Show and Silver Spoon Winner 2017 and 2018. He passed his 2nd stallion inspection in 2018. His son, Molehill Tucker, was national foal champion 2017. 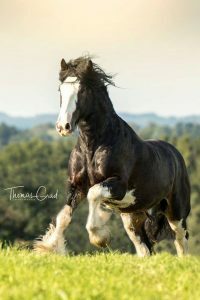 His son, Molehill Riker, became foal champion at the country show and was colt foal champion at the national show in Germany 2018.Duke is regularly vaccinated, dewormed and has full papers of the Shire Horse Society.He lives with mares and foals in a herd, is easy to handle and has a very lovely character.